Spend your money on eating French cuisine, shopping for one-of-a-kind items, drinking fine wine, sailing on the Seine and ascending the Eiffel Tower - not on a place to sleep. You won't miss the luxuries of a deluxe Paris hotel when you are out-and-about experiencing the beauty and elegance of Paris, France. Unlike other major world cities, like New York City or Tokyo, Paris has many small, family-owned historic hotels in central locations that you can stay in for under 100€ per night for a double. Below are our six favorite cheap hotels in Paris, France. 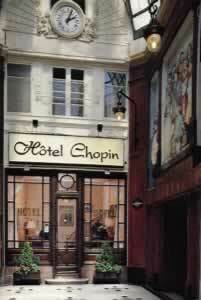 Located in one of Paris' hidden "passages" or glass-roofed pedestrian shopping arcades, the small, boutique Hotel Chopin is a designated Historical Monument. The 36 rooms are basic, yet comfortable, and decorated in calm yellows, sky blues, and warm melon colors. Each room contains a private bath or shower and a color TV, and are very quiet with no street noise since each room faces the pedestrian arcade. Shop outside at the arcades or stroll 10-minutes to the "Grand Magasins", the world's first large department stores, to shop-unti-you-drop. Spend an elegant evening at the Palais Garnier, the elegant 19th century Opera house, famous for its gilded gold statues and Chagall ceiling a quick 10 minute walk away, or visit the Louvre by metro (10 minutes) or on foot (20 minute walk). 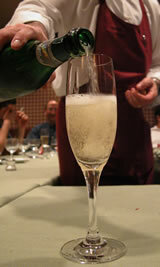 Hotel Chopin located in a charming Paris "passage"
Rooms start at 76€ per night. Hotel Chopin, 10 Boulevard Montmartre - 46 Passage Jouffroy - 75009; Phone: +33-01-47-70-58-10; Metro: Strasbourg Saint Denis or Grands Boulevards. RER B: Gare du Nord. The family-run Hotel Henri IV offers rock-bottom room rates in one of Paris' oldest and priciest residential neighborhoods. Located on the tip of Ile de la Cite, a small island in the Seine, and a few blocks walk to the Notre Dame Cathedral and the Latin Quarter, the Hotel Henri IV overlooks the Place Dauphine, a charming park framed by chestnut trees built in 1608 and named after Henri IV's son, the future King Louis XIII. All 15 rooms overlook the park and range in price from 47€ to 81€ depending on bathroom amenities. On a tight budget, pay 47€ for a single, with in-room sink and shared bathroom in the hallway, or spurge for a double bed with in-room bathroom, shower, and terrace for 74€. Ile de la Cite. 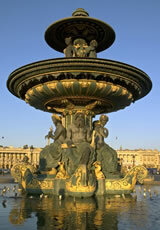 * The Hotel Henri IV is located behind the lush Square du Vert Gallent on Place Dauphine. 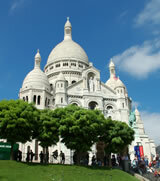 Rooms start at 47€ per night.Hotel Henri IV, 25 Place Dauphine - 75001; Phone:+33-01-43-54-44-53; Metro: Pont Neuf or Cite. * Ile de la Cite Photo © David Monniaux. Courtesy Creative Commons License. Named after the Rolling Stone's anthem, "Gimme Shelter", Mama Shelter is proof that chic and hip does not need to be expensive. Mama Shelter's owners, the family that also owns Club Med Resorts, hired the famous luxury interior designer, Philip Starck, to transform a graffitied, abandoned parking garage near Pere Lachaise cemetery into a rock-n-roll, high-tech hotel with rooms under 100€ per night. For the price of a one-star hotel in central Paris with a common bathroom, you can relax in a modern, light-filled room with high-end linens, free Wi-Fi, iMac computer that you can use to watch TV/DVDs or surf the web, a mini-fridge, and a modern bathroom with Kiel's toiletries. Pop culture touches like funky graffiti quotes in the carpet and hanging face masks of superheroes add a touch of fun to the minimalist design. Quirky Bedroom at Mama Shelter. Notice Batman night light next to bed. Hungry for snack? Help yourself to the free bread and Nutella in the kitchen, or design your own pizza at the pizzeria. After a day of sightseeing, hang out in the lounge and listen to live music with a crowd of young Parisians or have a creative cocktail in the Island Bar. 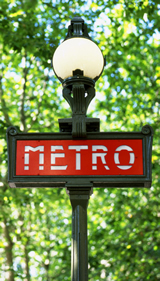 Take the metro to nearby Paris attractions (15 minute walk to metro), or rent a bike, scooter, or Smart Car onsite at the hotel. Room rates start at 79€ per night.Mama Shelter, 109 rue de Bagnolet - 75020 Phone: +33-01-43-48-48-48; Metro: Gambetta or Porte de Bagnolet on Line 3; Alexandre Dumas on Line 2 or Maraîchers on Line 9. A budget traveler's dream, the one-star Hotel Stella has rooms starting at 45€ per night in the pricey St. Germain des Pres area where hotels on the same street cost four times as much. Located around the corner from the one of the largest parks in Paris, the Luxembourg Gardens, and housed in an 18th century building with exposed wooden beams in every room, entering the Hotel Stella is like walking back in time. 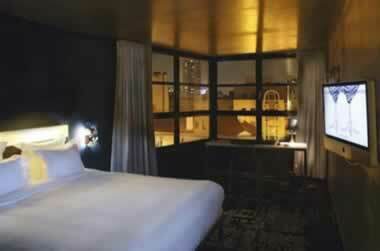 Rooms are a mix of antique furniture and contain a private bathroom with shower. One room even includes an antique piano. If you are traveling as a family, book the large suite with a double and two single beds. Basic room with ancient wood beams at Hotel Stella. Remember that at this price range "you get what you pay for" and you shouldn't expect matching linens, comfy towels, and a spotless atmosphere. 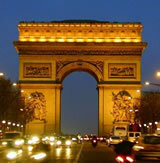 What you can expect is a great location with a private bed and bath at a price cheaper than most Paris hostels. If you are looking to stay in a hip, artsy area of Paris off the tourist track, but close to major attractions, check out the Hotel Magenta. The cheery purple Hotel Magenta's exterior stands out on a block of gray buildings. The central, five-line Republique station is a short walk away. From here, you'll be whisked to all tourist attractions in Paris in minutes. 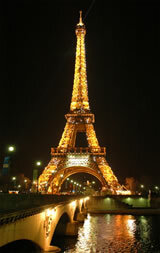 At night, walk to the trendy restaurants in the Marais district, or the popular clubs and bars on Rue Oberkampf. For a daytime stroll, walk a few blocks to the Canal St. Martin. Starting at 95€, the 65 rooms were remodeled in 2009 and contain modern, wood furnishings, mini-bars, laptop safes, and free Wi-Fi. The family-owned and operated Hotel du College du France is located in the heart of the historic Latin Quarter, next to the Sorbonne, the oldest University in the world. From the hotel, you can easily walk to the Notre Dame Cathedral, the Cluny Museum of Medieval History, the chic streets of St. Germain des Pres, and the famous rue Moffetard market. The 29 rooms start at 80€ per night and contain ceiling fans for hot evenings and free Wi-Fi. Personal touches such as room service for reasonably-priced drinks 24 hours a day, early check-in and roll-away beds for children are rare in hotels in this price range. 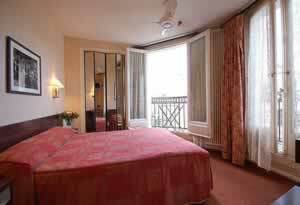 Standard double room at the Hotel du College de France. Rooms start at 80€ per night.Hotel du College de France, 7 rue Thénard-75005, Phone: +33-01-43-26-78-36; Metro: Maubert Mutualite or Cluny la Sorbonne. RER B St. Michel Notre Dame.